The date for our Spring 2019 Autojumble meet is Sunday April 28 at Great Leighs in Essex. Approximately 10.30am – 3pm. This will primarily be a meet and autojumble. There are unlikely to be any club spares for sale on the day. The date is to be finally confirmed as Rob Bamford has been unwell but he hopes to be fit enough to host by then. December 2018 – A past owner has kindly donated a number of brochures and leaflets to be auctioned to club members. This auction is to raise money for Alzheimer’s Research UK and all proceeds will go there. If you would like to bid on any of the items please visit https://www.32auctions.com/fccoc to see the items available. To bid you will need to register with the site – registration is free and easy. All the auctions end at 10pm GMT on New Year’s Day. The auction site 32auctions.com is free for us to use but it does carry advertising. These adverts are nothing to do with the club, so only click on them if you’re sure what they are for. March 2018 – We are in the process of putting our membership system on a new online database. For this first time this year you should receive an automated membership renewal notice by email. If you are not on email, or prefer to pay by cheque, there will be a renewal notice in the next magazine. We will no longer be issuing membership cards, but you can find all your details online here: https://www.fccoc.org.uk/membership-management/#myaccount. If this is your first visit you will need to request a password first by using the link on the site. There will inevitably be a few teething troubles as the new system beds in, but hopefully it will enable us to run more smoothly. The date for the Spring 2018 club autojumble is provisionally set for Sunday April 29th 2018 at Great Leighs in Essex. Approximately 10.30am – 3pm. This will primarily be a meet, barbecue and autojumble. There are unlikely to be any club spares for sale on the day. For 2017/18 we are reducing the Overseas membership rate to £23 per year to bring it in line with the UK rate. We value overseas members very highly and recognise they are less able to make UK events. We have a new volunteer for outbound parts, joining Stan Angerstein, in Essex, will be Tony Weller in the West country. Please continue to send all queries and orders to Treasurer Richard Mills. We are working to improve delivery time and adding new items of stock. It is we with great sadness that we have to report the death of our chairman’s wife Doreen Bamford after apparent complications with an investigative operation in October. As may have been obvious to those attending the Club’s Autumn Autojumble at Great Leighs in September, where Doreen (and Jennette) were raising money for an Ovarian Cancer charity, she was herself fighting a version of the disease. However many of us were looking forward to seeing her again in the spring. Her death has taken us all by surprise. Doreen Bamford was married to Robert for 47 years with a ten year courtship prior to that while they built the bungalow and other precursors. Doreen helped with the family business until they sold it and then worked as a nursing auxiliary near to home. Clearly Robert wasn’t expecting her to go before him and complains she hasn’t left a forwarding address. Incidentally Robert thanks those who knew about this earlier and sent cards or letters. He may not have read them all yet. We have given the go-ahead for manufacture of new front quarter-light rubbers for the Consul Capri. This represents a significant outlay for the club and we are therefore asking members who are interested to email the club to pre-order and pay a 50% deposit which will help the club’s cashflow. The expected selling price is £175 a pair so the deposit will be £87.50. The selling price may ultimately be lower depending on shipping costs and exchange rates. If you would like to pre-order please email accounts@fccoc.org.uk At present we do not feel it would be economic to remanufacture these items for the Classic 315. We now have the new style boot seal kit in stock which matches the original profile. Many thanks to John Lyus who has put in a huge amount of work to make this possible. Our club DVD is now available from the Regalia page. The DVD has three sections: the Production line, Earls Court motor show & ‘Greek holiday’. At the club meeting on 27th April 2014 a new constitution was adopted – a copy is here. The new constitution modernises the club’s operations and brings in a new role of vice-chairman. Horn Rings: The first batch has been delivered and are available for sale from 10 March 2014. A picture is available on the spares page. Constitution We are aware that the constitution of the Club is extremely out of date. We therefore plan to draft a new constitution between October 2013 and March 2014 for review and hopefully adoption in April/May. Consequently we do not plan to have an AGM this September as we feel it would be better to get an up to date constitution in place first. If anyone would like a copy of the current constitution, or would like to help in drafting a new version, please email accounts@fccoc.org.uk. Spares: Stan Angerstein from Basildon has kindly volunteered to pack & despatch orders. Please continue to send orders by post to the treasurer or by email to spares@fccoc.org.uk. 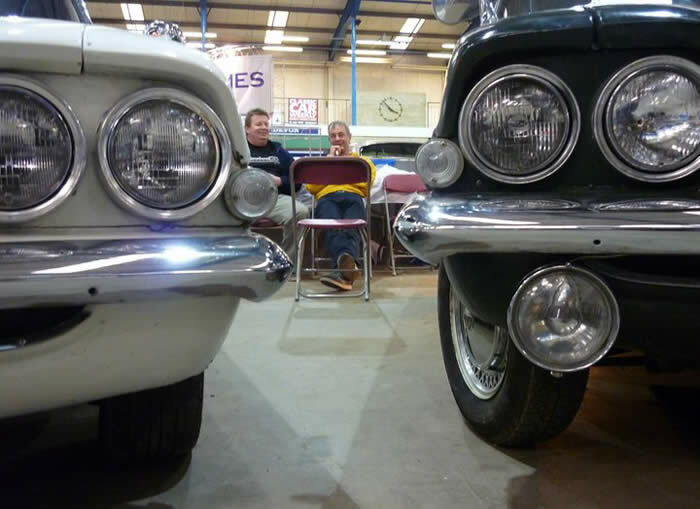 Sunday 28 April 2013 – we had a very successful Club Meeting & Autojumble at Great Leighs in Essex. Good weather, good food and plenty of spares & regalia on sale. Next one is in September. Prior to that our first ever meeting at the Ace Cafe produced a good turnout of 7 cars. Thanks to Graham Martin for organising this, and to Stephen Wickham for publicity. January 2013: Tony Sirett has resigned as Club Secretary. We are grateful to Tony for organising the September AGM and for carrying out a spares stock-take – no small task. Regalia: Our online Regalia shop is up & running. Please visit via the link above and choose from a selection of items. Prices include UK postage. 16th – 18th November 2012 We had a stand at the NEC Classic Motor Show. This was a great show and our stand received a lot of interest. Thanks to Paul Beckett & Steve Goodwin for their cars, and to many others for manning the club stand & helping with preparation. The show was incredibly busy with huge interest on our stand. Thanks to Stephen Wickham for the photos and designing the display posters. Spares: After 31 October 2012 we have nobody to despatch spares – we await a volunteer. So please check with the Club before ordering. In the meantime please send orders to the Treasurer’s address in the Club magazine, or email spares@fccoc.org.uk with any queries. It may take some time for spares to be despatched but we will be collating orders ready for despatch, and may be able to advise where else they can be obtained if necessary. AGM Feedback The Club autojumble and AGM were held on 23 September 2012 with a good number of people braving the wet weather. Welcome to Tony & Karen Sirett who join the committee. Larry Brown will be resigning as Spares Secretary on 31st October 2012 after many years service. We are very grateful for all he has done. We need a new volunteer to take over spares packaging and posting so please contact the Club if you can help. The stock is stored near Chelmsford in Essex. Next Club autojumble will be 23 September 2012 at Great Leighs in Essex, 10.30am – 3pm. See Google Maps location. Hopefully we will get better weather than in April. There will also be an AGM at 2pm. The AGM notice can be read here. July 2012: Can we get 51 cars for the 51st anniversary at Gaydon in July? Date is Sunday 22 July – see: http://www.heritage-motor-centre.co.uk/event/old-ford-rally-3/. If you haven’t already booked you’ll need to do so ASAP see http://www.heritage-motor-centre.co.uk/downloads/events/ofr/Old-Ford-Rally-12%20-%20Individual-Entry-01.pdf. A club stand has been booked and members booking individually will be directed to the club area when they arrive. 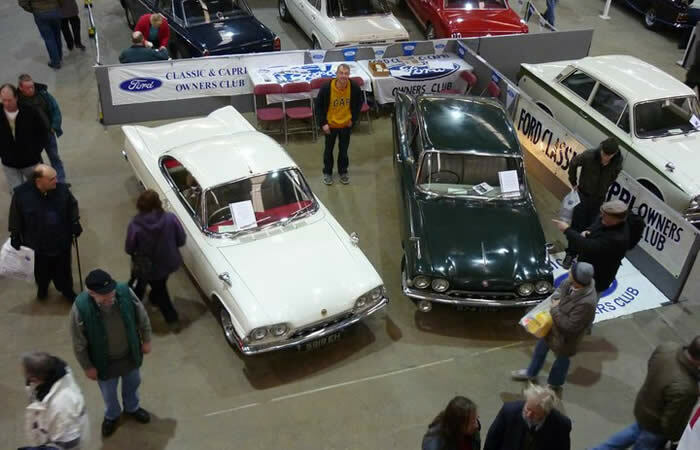 February 2012: We had a Club stand at the Footman James Ford Show and Great Western Autojumble show on 11 & 12 February. Pictures are up on our Flickr site – see http://www.flickr.com/photos/fccoc/sets/72157629267471079/. December 2011: 2011 was the 50th anniversary of the launch of the Classic & Capri in 1961. We had great turnouts at two events in 2011 – Great Leighs in April and Gaydon in July with over 50 cars participating. A superb 50th anniversary poster is still available (illustrated below) – email tracey@fccoc.org.uk for detail of how to order. 24 July 2011: We had around 44 cars at the Gaydon Rally on 24th July. Pictures are now on our Photostream (see http://www.flickr.com/photos/fccoc/). There are also some great pictures on the Facebook site. Some came in convoys including the groups from Brighton & Stoke. A fantastic day all round. 18 September 2011: Club Meeting & Autojumble, Chaseside, Great Leighs, Essex, CM3 1NL. 10.30am – 3pm. See Google Maps location. 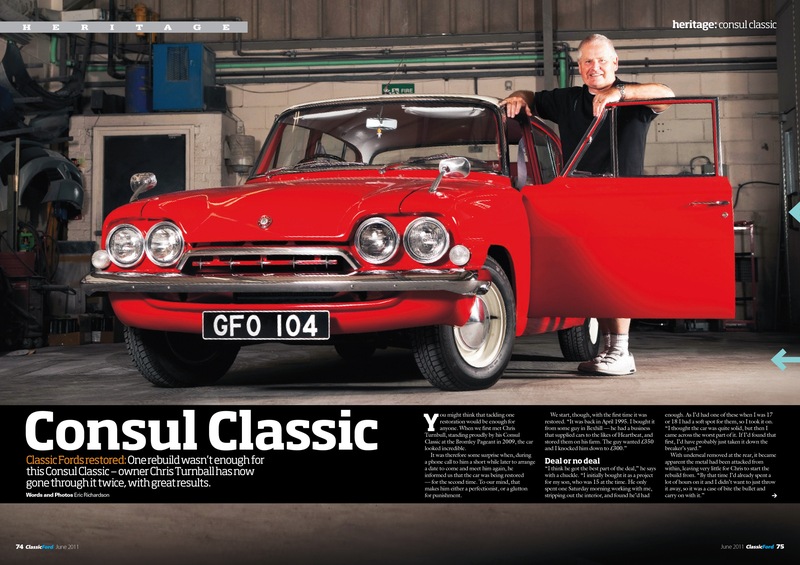 May 2011: See June 2011 issue of Classic Ford magazine for superb article on Chris Turnbull’s Consul Classic. 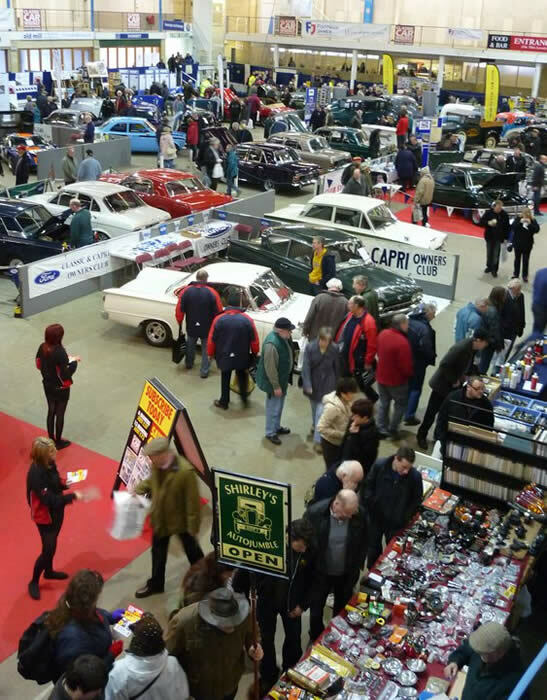 April 2011: Around 35 Classic’s & Capri’s attended our first 50th anniversary event. It was held at Great Leighs in Essex and was a great success with lovely weather, great food (as always), spares & panels for sale from Larry and a good choice of autojumble. For pictures see our Flickr page – a link can be found on the gallery page. Next stop – Gaydon in July. April 2011: Sunday April 17th. 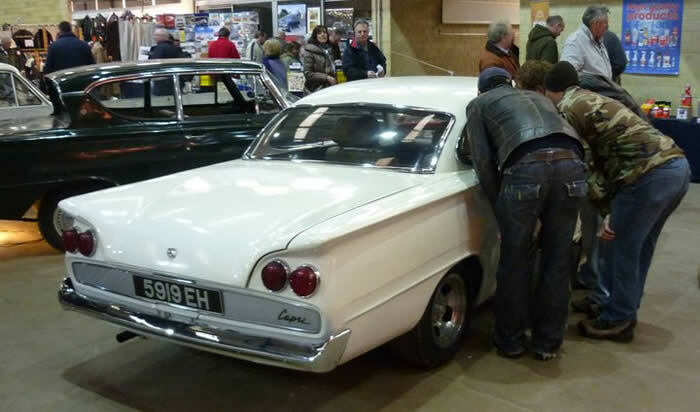 50th Anniversary Club Meeting & Autojumble, Chaseside, Great Leighs, Essex, CM3 1NL. 11am – 3pm. See Google Maps location. Please try & bring your car to this event as we hope to get 50 Classics & Capri’s together to celebrate the anniversary. Refreshments will be available. February 2011: Classic Car Buyer ran a two page article on the Great Western Autojumble show in their Feb 23 edition and10radio.org broadcast an interview with our team in the Taunton area after the show. February 2011 – new spares item: Handbrake lever dust cover . See spares page. February 2011: We had a Club stand at the Great Western Autojumble in Shepton Mallett on Saturday & Sunday 12th & 13th February, 2011 celebrating 100 years of Ford. The cars are owned by Darrell Luxton and Ashley Hawken. 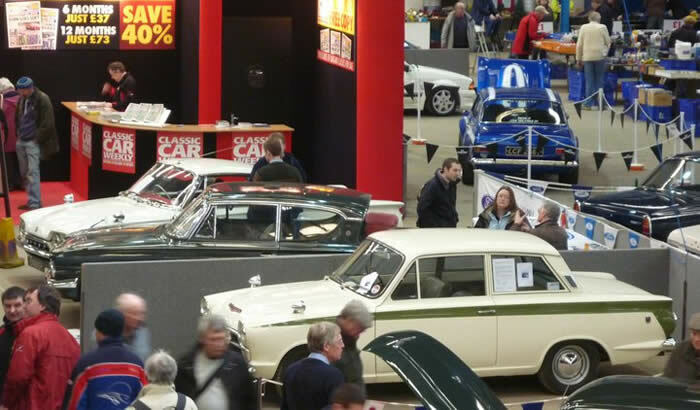 November 2010: Read about the club stand at NEC 2010 and see pictures. See the dedicated page NEC 2010. We had a Club stand over 3 days, November 12th 13th & 14th. 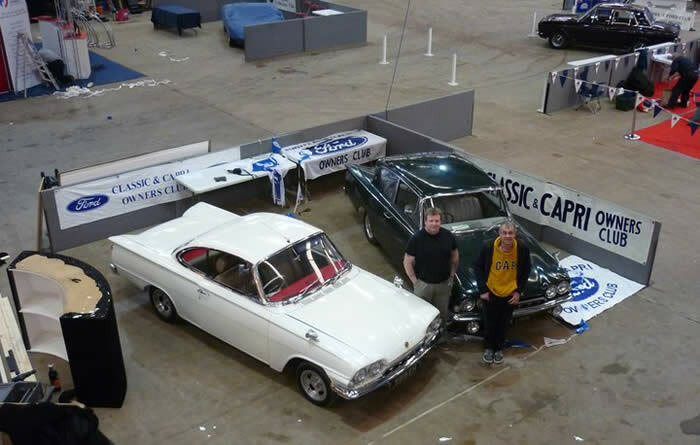 We had 3 cars on stand, 116e 2dr Classic, 109e Capri & 116e Capri GT. October 2010: Top Mounts – a newly remanufactured batch is now available an exchange basis. Cost is £75 + £75 deposit on old unit. Sunday 26 September 2010: Club Meeting & Autojumble, Chaseside, Great Leighs, Essex, CM3 1NL. 11am – 3pm. September 2010: Rear jacking points are now back in stock – see panels page for prices. July 2010: Top Mounts have been tested and manufacturing has been given the go-ahead. We are having about 30 units manufactured. these will be available to members on an exchange basis. Sunday 25 July 2010: Old Ford Rally at Gaydon – see http://events.heritage-motor-centre.co.uk/events_2010_old_ford.html. There will be a club stand at this event. June 2010: New Bonnet closing rubber stops are now in stock – see spares page. June 2010: Spares news – the first samples of our remanufactured Top Mounts are being tested and initial results are promising. We hope to have them for sale in a few weeks time. April 2010: Next year is the 50th anniversary of the launch of the Consul Classic & Consul Capri. Watch this page for news of special events in 2011. October 2009: See latest issue of RetroFord for review of stunning Consul Classic. Sunday September 27 2009: Club Meeting & Autojumble, Chaseside, Great Leighs, Essex, CM3 1NL. 11am – 3pm. July 2009: See Buyer’s Guide in August issue of Practical Classics – excellent article. June 2009: See the movie Telstar featuring a red Consul Capri! Released on DVD at end of September 2009!